CASA is central to fulfilling society's most fundamental obligation by making sure a qualified, compassionate adult will fight for and protect a child's right to be safe, to be treated with dignity and respect and learn to grow in the safe embrace of a loving family. Every day in this country, 1,900 children become victims of abuse or neglect, and four of them will die. Every day. 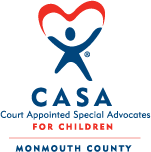 Court Appointed Special Advocates (CASA) for Children is a network of 951 community-based programs that recruit, train and support citizen-volunteers to advocate for the best interests of abused and neglected children in courtrooms and communities. Volunteer advocates—empowered directly by the courts—offer judges the critical information they need to ensure that each child’s rights and needs are being attended to while in foster care. Ready to take the next step? Find out you can volunteer.